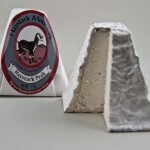 I first had a bite of Haystack Mountain cheese at the Boulder Farmer’s Market last year and their Haystack Peak has been one of my favorites ever since. Haystack Mountain Goat Dairy started on a small farm with a handful of goats and has since grown into an artisanal dairy of 8 hard-working folks producing 150,000 lbs. of cheese each year. On Friday I met with Maureen Reagan, Haystack’s Sales Manager, to walk through how this special goat cheese is made and responsibly sent to market. 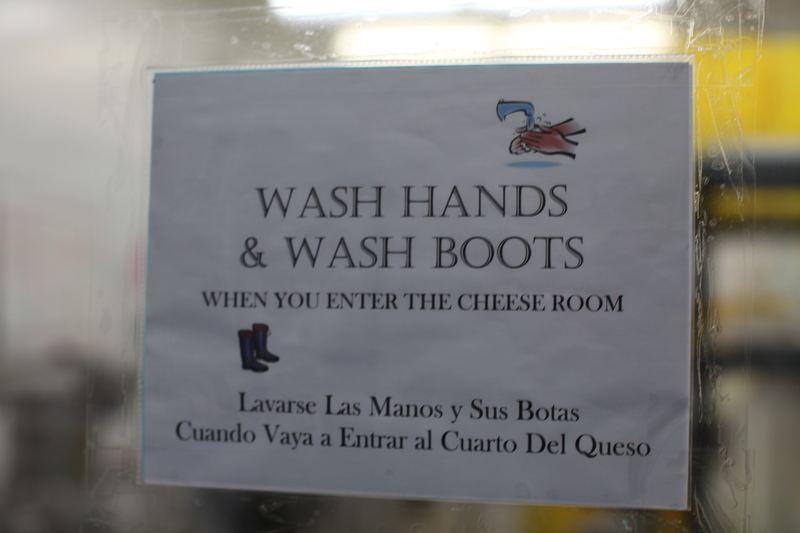 Before you even get a whiff of cheese curing in the caves you are struck by the odor of cleanliness. 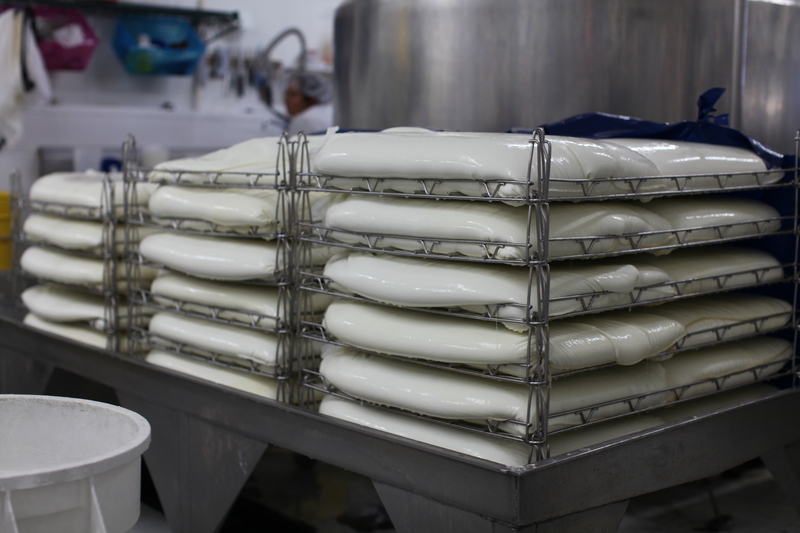 The creamery is one-part food prep and one-part laboratory, constantly being cleaned and sanitized. I donned my hair net and boot covers and made my way in. Maureen explained that half the day is spent cleaning just about every surface of the creamery. She went through 2 weeks of cheese making training when she started, learning each part of the process. She has a lot of respect for how much work goes into producing those delicious rounds of queso. It definitely looked like back breaking work cleaning those huge vats inside and out. After visiting a few of the different cheese caves, I met Jackie Chang, the head cheese maker of Haystack. She seemed to be in 3 places at once. With as many cheeses as they produce, there are all sorts of tasks from setting to flipping to wrapping that need to happen each day. Jackie was in the process of experimenting with a beer washed-rind set of cheeses in conjunction with Breckenridge Brewery. She sent me home with a small round of her Breckenridge Brewery IPA washed-rind creation. I am not ashamed to admit a friend and I promptly ate half of it a few hours later. It hasn’t even hit the market yet but I highly recommend it. She was also making a stout version. Beer and cheese are so good together and Jackie has now removed a step for us. When I met with Will and Coral at Cured they talked about the wonderful aspect of experimenting in American Artisanal cheese making and I got to see it at Haystack firsthand. 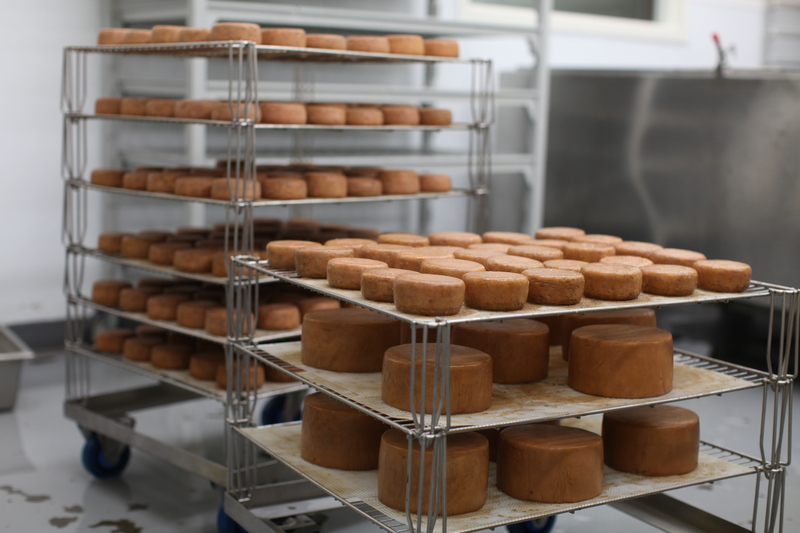 Aside from learning about the cheese making process, another interesting aspect of talking with Maureen was how they manage their product going to market. 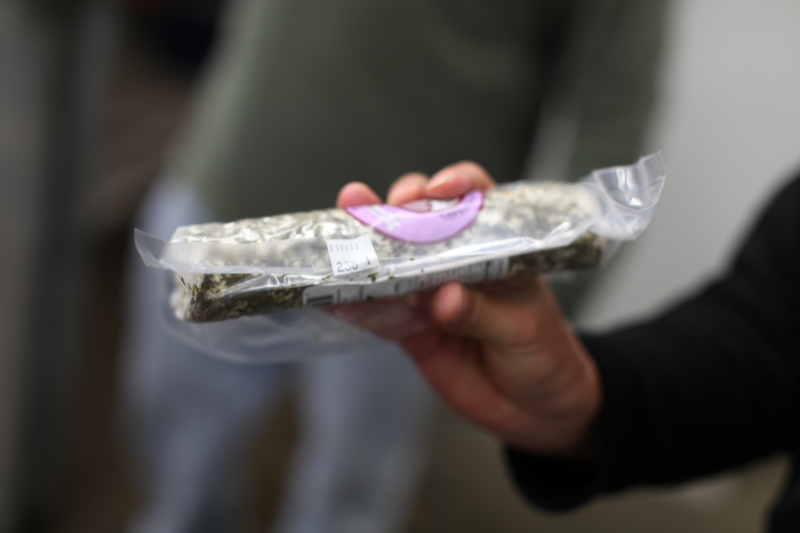 They hand date each package of cheese to ensure freshness. 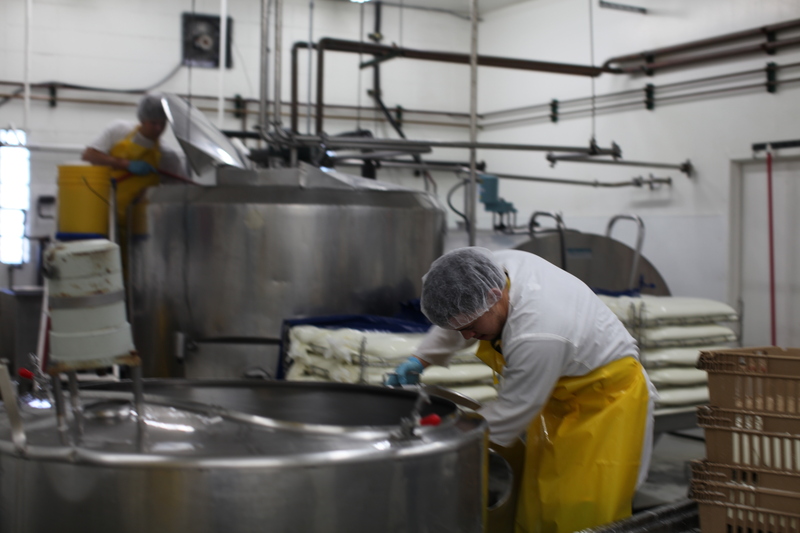 They also recently completed an entire freshness audit of their operation from the freshness level of each ingredient that goes into their cheeses to how the final product is handled where it’s sold in all their markets. They tracked each piece of cheese. Wow. I asked Maureen about the questions that arise in regard to raw milk cheese from time to time and how safe it is to eat. She shared that it’s frustrating for small producers who specialize in this because there isn’t really any foundation for the concern. There are more serious problems that arise with all other sorts of foods each year that don’t lead to the same concerns, such as spinach, tomatoes and melons. From her experience, other dairy operations use the same level of sanitation they pride themselves on and there have been few and far between cases that lead to sickness. Goat cheese is also lower in fat than other cheeses. Compared to cow milk cheddars and cream cheeses, Haystack Mountain Goat Cheese is lower in fat, calories and cholesterol. My husband just found out he has to go on Lipitor to lower his cholesterol, so he will be happy with a Haystack treat now and then. You are currently reading A Visit to Haystack Mountain Goat Dairy at 52 To Do.